I laughed at this topic, but my friend Melissa is curious and she’s pregnant. So I get it. She wanted to know how you could carry a baby and pee on the toilet. I’ll tell ya – strategically. 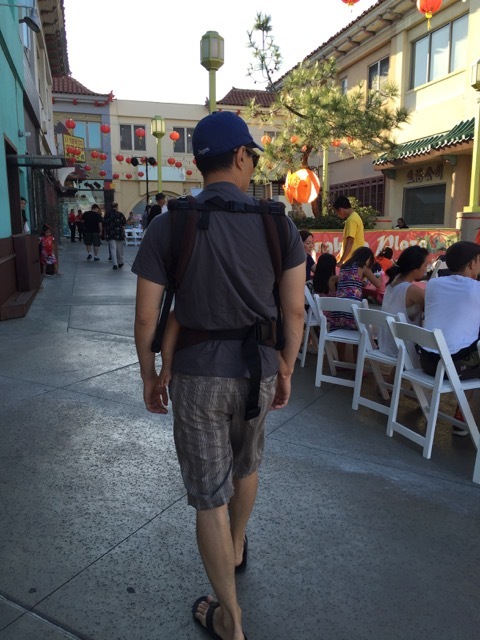 Unlike backpacks and 90s hip hop jeans, you want to wear your babycarrier on your waist, not your hips. You don’t want your SSC (soft structured carrier) sitting all hip hop – you are not TLC or <insert current popular rapper>. Give your body some support – that’s what those cushioned pieces are for! Before you even get the baby in the carrier, be sure your straps are bound with the attached elastic. Most carriers have a little elastic so that you can keep your straps wrapped up and not dangling. This is important. You don’t want the straps to be caught on anything as you walk with the baby. Below is a photo of The Wife wearing our baby in a Tula. See how he’s wearing the carrier on his waist and not his hips? That gives him access to the shorts’ waist/button. You’re going to be peeing “blindly” as you can see the front. I liken this to peeing in the dark. You have to figure out where the seat is, wiggle the baby up a bit in the carrier, unbutton and unzip, and sit down. (Before you sit, be sure your straps are bound up/shortened or tucked in within the carrier so there is NO chance the dangling straps get dunked in the toilet water.) Once you’ve done peeing, you’ll need to wipe – but you know where your body parts are. So do your thing. Get up and do the reverse. Wiggle your pants back up, zip, button, flush. Next challenge? Washing your hands. LOL. Depending on the basin and how deep it is, sometimes I wash one hand at a time or I stand sideways, parallel to the sink. Your baby will be none the wise. 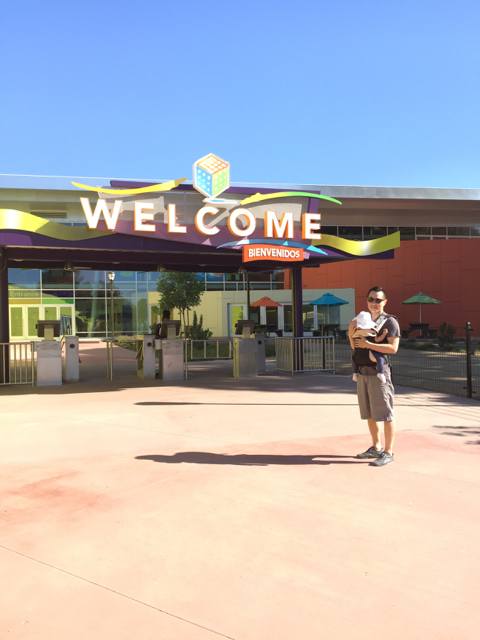 The worst bathroom experience I’ve had was at one of the Discovery Cube LA restrooms. The toilet was positioned very low, probably for children. I had to almost squat down and I worried about my straps. Luckily they were bound with the elastic (I wore my Ergo 360), and I could do my business and go. The Wife wearing Spawn in the Ergobaby 360. At Discovery Cube LA, there is a sink trough which is a slight challenge. Luckily you don’t need to turn on the faucet because it is motion-sensored. Woot! 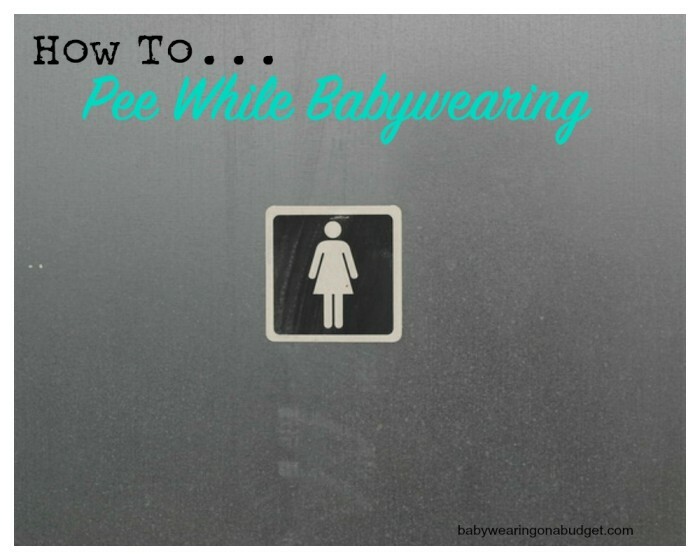 Tell me in the comments – have you mastered wearing your baby and peeing?